As if iPhone developers don't have enough challenges simply dealing with Apple's somewhat unpredictable and arbitrary approval process, now there's the software pirates to worry about, too! There have been recent articles in the tech news circles talking about a new utility called Crackulous which makes it fairly simple for someone with a "jailbroken" iPhone or iPod Touch to steal apps rather than buy them in the iTunes store. 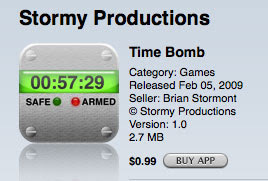 Since I am trying to make a living developing iPhone apps, I'd prefer people pay the 99 cents for my app rather than steal it. 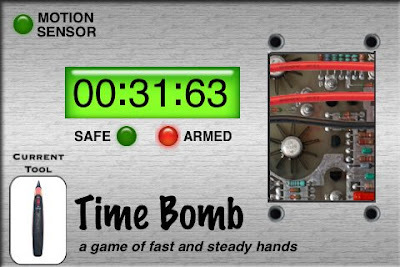 So, in my recent Time Bomb app, I included some code to detect when an app was running when it hadn't been purchased. I figured I'd be obvious about it and I pop up a message on the offending iPhone or iPod Touch and tell the user that the app was stolen and it won't function properly. And then, as promised, the app won't function properly. Surprisingly, I just discovered that my app was in fact pirated and thieves users have begun reporting receiving the friendly message I included. It was even written about recently on CNET.com. You can read the brief article here, or read my take on it on my Stormy Productions blog here. Ah, the joys of software development. Never a dull moment, that's for sure! I wouldn't be surprised if some pirate with a bit of free time on his or her hands will take the time to work around my anti-piracy code. And then, I suppose I'll add a few more counter-measures to the next update of my app, requiring a pirate to spend a bit more time to crack it. All this for something that only costs 99 cents, too. If you are thinking about developing software for the iPhone and iPod Touch, it's good to be aware of the major source of frustrations that come with it: Apple's review process! Being self-employed, I now have to purchase my own health insurance. Ah what joy! But that's not the point of this post. As part of my health plan with Blue Cross Blue Shield, I receive a periodic magazine (hmmm... a periodical?) called Choices. The point of the magazine is to give you tips on a maintaining a healthly lifestyle, since if you stay healthly, your health insurance provider makes more money. You pay them, and they can just keep the money. As a health insurance provider, it is in their best interest that they keep their customers as healthy as possible. After all, they are a business and businesses want to optimize their revenue. So, it was nice to see in this current issue of their magazine that they make some mention of the health benefits of Zen meditation and Buddhist philosophy. They don't actually use the words Zen or Buddhism (probably to avoid scaring off their readers) but the advice is definitely the same. 1) "Short-circuit the stress system" by deep breathing or meditation. The article goes on to describe various breathing and mediation techniques. 2) "Challenge your thoughts. Your thoughts are what create your feelings... Treat your thoughts as hypotheses, not fact." Again, this is a Zen philosophy. It's nice to see the health benefits of the Zen/Buddhist philosophies are starting to make it into the mainstream.